Nintendo’s policy of cheap, cheerful and (most importantly) addictive and original gameplay has paid off in spades with the Nintendo DS. Managing to hold its own against the flashy Sony PSP (and outsell it in Japan), the cheaper and more accessible DS arguably also has the better selection of games. Not bad for something initially derided by some critics as a gimmicky toy. Continuing their trend of re-releasing old games with new features, Nintendo have released a new version of the game that started the Game Boy revolution over 15 years ago: Tetris. After all these years it still plays in exactly the same addictive way. Now however there a few subtle changes to its look and feel. 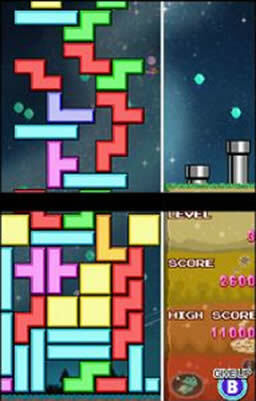 As well as 6 new ways to play Tetris, the DS’s two screens allow the falling blocks to span a larger area. As you progress (whether you use the traditional method of moving by the control pad, or try playing with the stylus), the look of the game alters, taking the appearance of various famous Nintendo characters. Mario, Luigi, Yoshi and Link (of Zelda fame) to name just a few appear when you reach a new level. This is not just a cosmetic update, your progress in the Tetris game helps the characters progress their own games. The icing on the cake is the ability to play Tetris against other people. If ten of you are lucky enough to own a DS, then you can play each other in a massively competitive knock out round. Even better, only one of you has to own the game, the DS can broadcast the game to nine other people in the same room as you. If no-one is nearby to play against you, no worries – just Nintendo’s ‘Wi-fi Connection’ to play three other people online for free. You don’t even need wireless broadband at home – Nintendo and BT have teamed up to offer free online gaming wherever there is a BT Openzone hotspot. Conclusion: Even if you prefer to play the game on your own, this update to a classic is worth every penny to anyone nostalgic for a simpler time when space invaders ruled the earth, or more accurately Game Boys did. Price: £30 in the high street. Score: 4 out of 5.